It is a strange and almost amusing fact that there should be at the same time, on the part of the general public, such a general acceptance of the existence of personal magnetism, on the one hand, and such an ignorance of the nature of this wonderful force, on the other hand. In short, while everyone believes in the existence of personal magnetism, scarcely anyone possesses knowledge of the real nature of the same, much less a working knowledge of its principles of application. This book gives you the key to the secret of personal magnetism, but it will still remain up to you to determine just what degree of success you will attain. The best tools and instructions as to how to use them are provided - but you will have to do the rest yourself. Success must and will be yours if you will follow the instructions carefully, persistently and perseveringly. 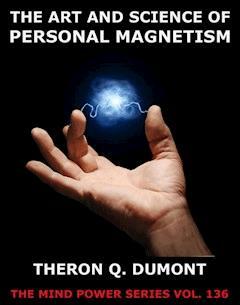 I take pleasure in presenting to many American students who will acquire possession of copies of this book, these practical lessons on the art and science of Personal Magnetism. These chapters contain the gist of the lessons taught be me, in classes, and to individuals, in my courses of personal instruction conducted by me, here in Paris, for the past eighteen years. In my personal class work, of course, I adapt the instruction to the special requirements of my individual students, which I cannot do in the case of general lessons in printed form. But, notwithstanding this, I feel that I have condensed into these pages the essence of my methods, and principles of practice, so that any student of average intelligence may readily grasp, assimilate, and apply the same with success, at least, I feel that if the student does not accomplish this, it will be his or her own fault, not that of myself. In introducing this book, I with to express my obligations to Mr. L. N. D., an American student of mine, here in Paris, who has kindly transformed my rather stilted "guidebook English" into the plain, simple form desirable for a book designed for the general public. I feel particularly indebted to him for supplying the idiomatic, American "man on the street" terms, thus reproducing the conversational style which I use in all my lessons in French, but which my "book English" rendered impossible in this case without the kindly assistance of this worthy gentleman. But this lack of knowledge just alluded to is confined to the general public. In all ages there have been a few advanced individuals who have thoroughly understood and employed the force of personal influence. Not only have the occult students of the past possessed this knowledge, and have passed it on to their successors, but many of the greatest men of history have acquired a thorough knowledge likewise, and have employed it in advancing their own interests. In some cases, individuals of this last mentioned class have received direct instruction from occult teachers, but in many cases they have stumbled across the existence of the power within themselves, and then advanced in their knowledge of the subject by careful investigation and study, accompanied by constant experimentation. Many of them, in their writings or sayings, have testified to their knowledge and us of this most wonderful power. It is difficult even to correctly define the term "personal magnetism," so little are its principles understood by the masses of the people. The dictionaries give us but little help in the matter, so vague are their so-called definitions. Perhaps the best definition is the following: "the strong, peculiar, but little understood power, force, or influence, exerted by certain individuals, in varying degrees, by the means of which other persons are attracted to, controlled by, dominated, or influenced by the individual possessing the power; a form of mental influence exerted by certain individuals over those with whom they come in contact." Even the most "un-magnetic" person possesses personal magnetism, perhaps even to a considerable degree, but is generally so ignorant of the nature of the force of the means of its employment, that he or she actually repels other persons instead of attracting them. For, do not fail to note this fact, personal magnetism, like material magnetism, may repel as well as attract - it has its positive as well as its negative side. Many very repellent persons are really manifesting a high degree of personal magnetism in a negative form, and are driving away persons from them in the same manner that others attract persons to them – it is all a matter of the use of the power. This personal atmosphere varies greatly in degree of strength, extent and general character, among different individuals. The average person has but a weak personal atmosphere, which extends but a short distance on all sides of him, while the strong characters of the race are surrounded by a widely spread personal atmosphere of great, power, especially when they are aroused by any strong emotion, feeling or desire. The personal atmosphere of those strong individuals, who are generally recognized as leaders of the race, usually extends great distances from the person, and is fairly saturated with strong dynamic magnetism, which impresses itself strongly upon those coming within their field of influence. But even the weaker individuals of the race, or using personal magnetism unconsciously, exert at least some degree of influence upon those around them. It requires but a moment’s thought to recognize that some persons emanate an atmosphere of good-cheer, brightness, and happiness, which affects in a desirable way all persons with whom they come in contact. Others, in the same way, are surrounded by an atmosphere of gloom, pessimism and discouragement, which adversely affects persons coming near them. These things are too common to even excite interest among the average persons, but in this phenomena may be found the key to the higher forms of personal magnetism. We are so accustomed to regarding personal magnetism as meaning only the positive, attractive phase, that it comes as a shock to some of us to be told that the repelling personal atmosphere is equally "magnetic" – that is, magnetic in the wrong direction. This should cause no wonder, when we remember that even the physical metallic magnet repels, under some circumstances, as strongly as it attracts under others. There are, it is true, certain individuals who seem neither to attract nor repel, but this does not affect the general rule. These neutral individuals are usually of weak magnetism, and weak character – that is to say they have no strong motives, aims or desires, or strong cast of character or personality. Each faculty of the mentality is neutralized by some other faculty of equal strength, and the result is a neutral condition akin to lukewarm water- neither hot nor cold. It follows, naturally, that such persons exert but a neutral influence, and have but a weak neutral personal atmosphere. They neither attract nor repel – they simply "bore" persons with whom they come in contact. Some may raise the question that if, as I have said, each and every person is possessed of personal magnetism, then why should any one bother any more about the matter, or study the subject of personal magnetism at all. Such a question (and it is frequently raised, for that matter) causes a smile to manifest on the features of those who have knowledge of the subject; so childish does it seem to them. While it is true that each and every person is possessed of personal magnetism to some degree, it is equally true that the majority of persons have but a weak magnetic force, and that often of a negative or undesirable character. And, it is a fact positively known to those who have mastered the subject, that even the weakest and most negative person may so develop his or her personal magnetism as to gradually acquire the same degree and character of magnetism as that possessed by many individuals originally far in advance of them in magnetic influence. One may completely change the character of his personal magnetism, from negative to positive, from undesirable to desirable, by careful study and practice along the lines, which I shall lay down in this book. Moreover, it is possible for any person possessing sufficient will, perseverance and determination to develop from a puny state of magnetism into a condition of giant magnetic powers. But this latter requires determination, constant practice until a certain stage is reached, and an indomitable will. While any one may easily increase his or her degree of power of personal magnetism, and still more easily change the character of one’s personal atmosphere, the higher prizes are reserved for those who will persevere to the end, and continue faithful in the exercises. This, of course, is true not only of personal magnetism, but also of every other thing worth having. There is no royal road to anything worth having. We must work for what we get. The prizes are not for the weaklings and triflers, but for the persistent, earnest individuals who will "hang on" until they succeed. In this little book, I give you the key to the secret of personal magnetism, but it will still remain for you, yourselves, to determine just what degree of success you shall attain. I give you the best tools, and instructions as to how to use them – but you will have to do the rest yourself. This I will say, however, success must and will be yours if you will follow the instructions carefully, persistently and perseveringly. That is all I can do for you – the rest is in your own hands. Some of the writers on the subject of personal magnetism have fallen into the error of considering that the entire secret of personal magnetism is to be found in the phenomena of telepathy or transference of thought. These writers, however, have been so carried away by the wonderful facts of the mental phase of personal magnetism, that they have entirely overlooked the other phase, i.e. the physical pole of the magnetic personality. This second phase is just as important as is the mental phase, and the person who wishes to cultivate and develop personal magnetism must give this second phase the same careful attention and practice as the first phase. There are two distinct phases or poles of personal magnetism, (1) the mental and (2) the physical. Do not fail to note this fact, for your success will depend upon the coordination of the force of both poles. To many, this idea of there being a second or physical phase of personal magnetism will seem strange, so accustomed have they grown to hearing the teachings that personal magnetism is a mental phenomenon pure and simple. But as we proceed in our study of the subject in this book, I hope to thoroughly convince you that this second pole of personal magnetism really exists, and that it is equally potent as the first, or mental phase or pole. A man is a dual organism, with both mental and physical phases of manifestation, both mind and body, so is his personal force composed of two distinct phases or poles, each coordinating with the other in the work of manifesting energy and creating effects. Some persons have more mental magnetism, while others have more physical magnetism, but the individual who really manifests the highest degree of personal magnetism is the one who is developed along both poles of activity, both phases of magnetism – physical as well as mental. The mental pole or phase of personal magnetism depends for its force and energy upon the ability of the mind to create thought-waves and to project them beyond the limits of the brain, into the personal atmosphere of the individual, and even beyond the range of his own personal atmosphere when necessary. When accompanied with the physical magnetism generated by the other pole of magnetic activity, this mental magnetism strongly affects other persons coming within the field of action of these thought-waves. But without a good supply of the physical magnetism, these thought-waves fail to have sufficient strength to produce marked results. It would seem that the physical magnetism were needed to give "body" to the mental magnetism, just as the mental magnetism is needed to give color, character or "soul" to the physical magnetism. The two phases of magnetism must work together to gain the best effects. It was formerly very difficult to convey to the mind of the student the facts regarding the mental phase of personal magnetism, so strange did the whole thing appear to him. But in these days, when there has been so much written and taught regarding telepathy, thought-transference and mind-power, the average person is so well posted on the general subject that he may readily understand the special features of thought-power as manifested on personal magnetism. So it is not necessary, now, to first give the student a thorough education regarding the general subject of telepathy, in order to lead him up to the special subject of personal magnetism. In this book, I shall take it for granted that the student knows something of the subject of telepathy or thought-transference, and accordingly I shall not take up space and time in traveling over this old familiar ground. But, nevertheless, I think it advisable to point out to you some of the latest facts discovered by science in connection with the transference of thought. Science has discovered that the human brain, in the processes of thinking, actually generates and uses up a certain amount of energy in the area of the brain tissue. The generation and employment of this energy produces heat, and actually increases the temperature of the brain areas, as may be proven by the use of the delicate registering instruments. Found in every well-equipped brain is as much an actual force as is electricity or the ordinary magnetism of the lodestone, and is governed by much the same general laws and rules. And, like electricity or ordinary magnetism, it is not confined to the point at which it is generated, but, instead, it may be, and is, diffused to points beyond. In other words, the thought energy of the brain of a person extends beyond the limits of his brain, creates a thought-atmosphere around him, and registers an effect upon the brains of others coming within his field of energy. The discovery of radio-activity in certain newly discovered elements of matter, notably in the case of radium, has led science to investigate the matter of the possible radio-activity of other substances. The result is most surprising, for advanced science now announces that every substance is radioactive, that is, every substance is constantly radiating energy of force from itself. This discovery serves to harmonize the previously separated facts regarding thought-transference, etc., and it is now accepted as a fact that the human brain is strongly radioactive, and is constantly sending forth streams of radio-energy. The same laws, which govern the radium, are now perceived to govern the brain action. This simplifies the matter, and brings the subject of thought-transference into the general field of science, and out of the realms of mysticism. The subject is now taught and studied, on a scientific basis, in the principal universities of the world, and new discoveries are constantly being made regarding it. The physical pole of personal magnetism is not to be found in the flesh, blood, or bones of the body – for these are but the crude machinery by which the higher parts of the human organism moves and acts. Instead, it is to be found in that most wonderful part, or parts, of the organism, known as the nervous system. This nervous system is just as wonderful in its way as is the brain, and its effects in personal magnetism are just as important. We are so apt to think of the nerves as being a part of the "body" of the person, that it is somewhat difficult for us to get the idea that the nervous system is really as much a part of the mental system as is the brain. In fact, the nervous system is composed of almost exactly the same kind of matter, as is the brain. The nervous system, moreover, generates energy of a kind very similar to that generated by the brain. For that matter, advanced science really considers that the brain and nervous system are but parts of one and the same thing, governed by the same general laws, and to be considered in connection with each other. And, the student of personal magnetism soon comes to accept this view, when he sees the important part played by the great nerve centers in the work of personal magnetism. Therefore, although I call the magnetism of the nervous system by the term "physical," and that of the brain by the term "mental," I do so merely in order to make an easy line of distinction for the purpose of teaching and study. At the last, however, they are really but parts of one and the same thing – merely two poles of the same source of energy. The nervous system of the human being is really a most intricate mechanism. Its main feature is the spinal cord which runs along an opening in the spinal column or backbone, and which is directly connected with the brain matter in the skull. From the spinal cord emerge many sets of nerves, in pairs, which branch out in smaller filament, these in turn branching out into still smaller, and so on, until each and every part of the body is supplied with a direct connection with the main nerve trunk. Other great cables of nerves descend into the trunk of the body, apart from the spinal cord system, although connected with the latter by nerve links. In different parts of the body are to be found great masses of nerve-substance, being matted knots or tangles of nerves, these centers being called plexus or plexuses, the principal one being the "solar plexus" which is situated right back of the pit of the stomach, and which plays a very important part in the life of the person, so important, indeed, that a severe blow struck directly over it may cause the death of the person. The nervous system not only conveys messages from the different parts of the body to the brain, but also serves to convey the energy of motion to the various parts. In short, there can be no motion of any part of the body unless the impulse comes over the nerves. When the nerves governing any part of the body are paralyzed, that part of the body becomes devoid of motion. So you see, the nervous system is a part of the great energy-producing system of the body – as much a part of it as is the brain. Remember this, always, for it is one of the keys to the secrets of personal magnetism.